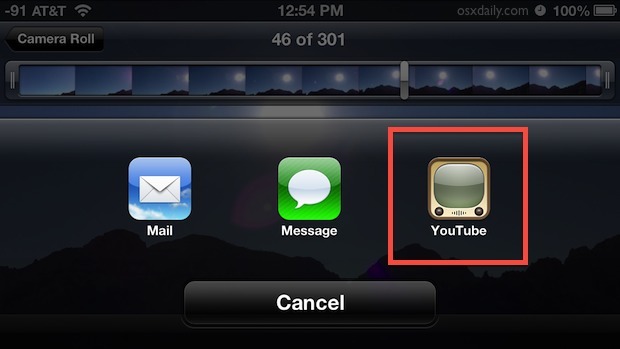 You can easily upload a video directly to YouTube right from your iPhone, iPod touch, or iPad. This feature has actually been around for a long time, but as YouTube gets more and more popular, it’ll certainly get more useful to have direct uploads like this. Videos uploaded over wi-fi is recommended, as uploading from a 3G/4G and LTE connection will be more compressed than videos uploaded while connected through Wi-Fi, so keep that in mind before posting something you want in high definition. For full 1080p quality, you’ll still want to transfer the HD movies from iOS to a computer, though trimming a video down to a shorter selection is also a quick way to preserve some quality from mobile uploads. Mac users can do the same from Share Sheets in OS X, and choose from other video services as well, suggesting future versions of iOS could expand on the sharing options. 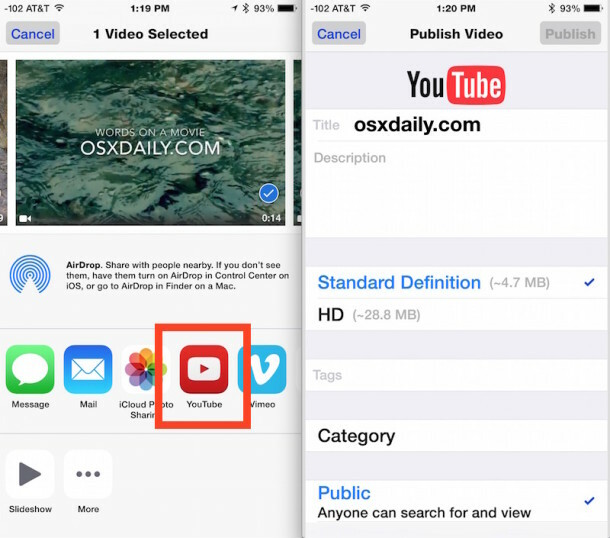 Nonetheless, the feature and uploading is identical, so enjoy, and share those videos! With iOS 6, you can “browse to upload”. So you can go to youtube.com, click desktop version, sign in and upload as if you were on a desktop. For large files, I try to touch the phone every couple minutes so the safari upload session doesn’t time out.